Beamond Court as the building was known, consisted of 23 studios, 16 one bedroom flats and warden accommodation plus communal facilities. 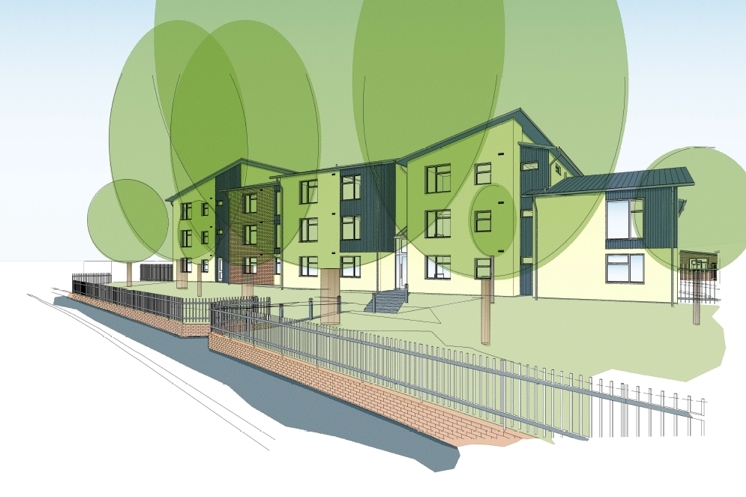 The Association was granted planning permission to convert the building into 46 one bedroom flats, warden accommodation and new communal facilities. Wilding Butler Construction Ltd began on site in June 2012 and work is progressing well despite some problems with utility services being where the plans said they shouldn’t be and the excessively wet weather earlier this year. Creating the extra flats and facilities has meant a lot of demolition including removing the old roof, not an easy job on such a compact site. Fitting of the new roof is currently under way and it is hoped to have the building 90% watertight by the end of this year. In the New Year work will commence inside creating the new flats and also cladding the exterior of the building to improve insulation. We hope to take possession of the completed building, ready to let, towards the end of 2013 and currently have 20 applications for the building when it opens. This entry was posted in Uncategorized on December 21, 2012 by agamemnonha.